Telecoms firm denies it is a ‘co-conspirator’ in ruse to divert funds meant for education. Digicel, the Caribbean telecoms company owned by Denis O’Brien, has become embroiled in a $1.5 billion US lawsuit over allegations it is a “co-conspirator” in a “ruse” to divert cash that is meant to fund education in Haiti, but is instead allegedly spent corruptly. The company is among five businesses and several current and former political leaders of Haiti – one of Digicel’s most lucrative markets – who are being sued in New York by US residents from the Haitian diaspora over the alleged “scam”. Digicel last night said it “categorically denies . . . any wrongdoing of any kind” and insisted it follows the law. 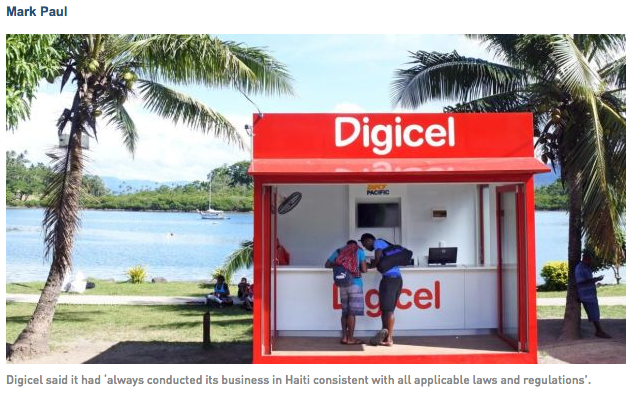 “Digicel has always conducted its business in Haiti consistent with all applicable laws and regulations,” it said. The class-action case revolves around levies that the Haitian government applies to all international phone calls and money transfers to and from the impoverished nation. A fee of $1.50 is automatically added to every money transfer, while an extra 5 cents per minute is added to every international call. Digicel controls more than 70 per cent of the Haitian telecoms market, and the overwhelming majority of international calls between the nation and the US are connected via its telecoms network, therefore it is the main collector of the 5 cents per minute that is passed on, purportedly to fund free education.